Aim of the Study: The present study attempts to explore various types of lesion of the uterine cervix and to find target age groups in which screening efforts can be concentrated for early detection of cervical cancers. Materials and Methods: The study was carried out at a tertiary care institute during the period from May 2016 to December 2017. All the previously conducted cervical Papanicolaou (Pap) smears were analyzed and reported as per the 2001 Bethesda system. The data were noted in a structured pro forma and evaluated. Results: A total of 5025 Pap smears were examined. Maximum number of patients was in the age group of 31–40 years (33.25%). 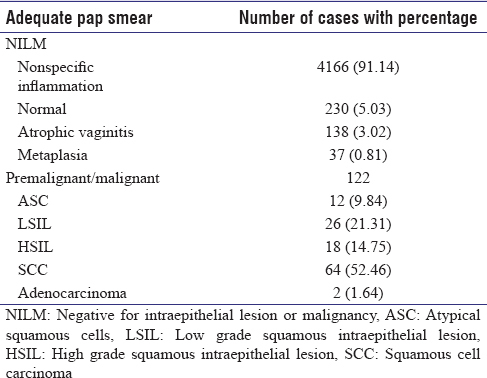 Out of 5025 pap smears, 6.60% (332) of cases were found to be unsatisfactory or inadequate samples, 90.97% (4571) cases were reported as negative for intraepithelial lesion or malignancy, and 2.43% (122) cases had epithelial cell abnormality (ECA). Premalignant lesions such as: atypical squamous cells of undetermined significance (ASCUS), low-grade squamous intraepithelial lesion (LSIL), high-grade intraepithelial lesion (HSIL) and atypical squamous cells-cannot exclude HSIL (ASCH), and malignant lesions such as squamous cell carcinoma and adenocarcinoma were reported under the ECA positive cases. Majority of premaligant lesions found in the age group of 41–50 years and constitute 44.64% (25/56). Whereas, majority of frank malignancy cases found in the age group of 51–60 and >60 years constituting 43.94% and 37.88%, respectively. Among all the ECA positive cases, 54.10% of cases found to be with malignancies. Conclusion: Proper implementation of Pap smear screening examination can decrease the incidence of cancer cervix along with its downstaging by early detection of precancerous lesions. The present retrospective study was carried out with an objective to evaluate cervical smears and its role in the screening of cervical cancer and precancerous lesions in a tertiary care hospital. The present retrospective study was conducted on 5025 patients undergoing Pap smears examination by conventional method in the Department of Pathology at a teaching tertiary care hospital of the Eastern zone of India during the period from May 2016 to December 2017. Relevant clinical data were obtained from the patients and recorded. The specimen for Pap smears were collected from the squamocolumnar junction by the Ayer's spatula and cytobrush under aseptic methods, and the obtained cellular materials were quickly smeared on a clean glass slide. Slides were fixed with absolute alcohol and were stained with Pap stain. Slides were examined under the light microscope and reporting was done by cytopathologists as per the 2001 Bethesda system. The data were compiled in a structured pro forma and analyzed. Previously diagnosed cases with any kind of cervical lesions benign, premalignant, or malignant lesions were excluded from the study. A total of 5025 Pap smears were examined. Maximum number of patients (3161/5025 = 62.90%) were in the age group of 31–50 years [Table 1]. Majority of the patients were presenting with the chief complain of vaginal discharge (63.00%:3166) followed by lower abdominal pain (25.20%:1266) and postmenopausal bleeding (8.26%:415), and 3.54%:178 of the patients were attending the clinic for a normal routine check-up. The findings of pap smears were broadly classified into two groups such as unsatisfactory smears and satisfactory/adequate smears. There were 332 (6.60%) unsatisfactory smears and 4693 (93.40%) adequate smears. The unsatisfactory or inadequate smears were due to either paucity of squamous cells, excess blood, or heavy inflammation obscuring squamous cells. Negative for intraepithelial lesion or malignancy (NILM) was reported in 97.40% of all the adequate smears and 90.97% of the total smears taken for the study. Out of all the NILM cases, majority cases (94.97%, i.e., 4341/4571) were reparative benign cellular reactive changes, followed by normal smears (5.03% i.e., 230/4571) [Table 2]. Out of all the benign reactive changes, majority were nonspecific inflammation followed by atrophic vaginitis and metaplasia constituting 95.97%, 3.18%, and 0.85%, respectively [Table 2]. The rate of nonspecific inflammatory positive cases was 82.90% in comparison to total smears taken. A total of 122 smears were reported to have epithelial cell abnormality (ECA) positive consisting of 2.60% of all the satisfactory smears and 2.43% of the total smears taken in the study. 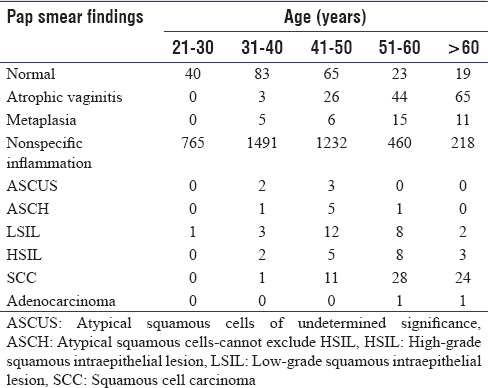 The majority of ECA positve cases were squamous cell carcinoma (SCC) constituting 52.46%, followed by low-grade squamous intraepithelial lesion (LSIL) (21.31%), high-grade squamous intraepithelial lesion (HSIL) (14.75%), atypical squamous cells (ASC) (9.84%), and adenocarcinoma (1.64%). Out of 12 cases of ASC, five cases were ASC of undetermined significance (ASCUS) and 7 cases were ASC-cannot exclude HSIL (ASCH). Majority of ASC, LSIL, and HSIL patients belonged to 41–60 years age group constituting 75% (42/56). Whereas, majority of SCC were found after the age of 50 years constituting 82.25% of cases and both the cases of adenocarcinoma were reported after the age of 50 years [Table 3]. With the changes in the lifestyles and demographic profiles in developing countries, noncommunicable diseases, like cancer has been a major cause of morbidity and mortality. In the developing countries including India, cervical cancer is a major part of morbidity and mortality among all the female malignancies. However, it is a readily preventable and diagnosis can be possible at the preinvasive stage with proper cytological screening. There are various screening tests for cervical cancer such as Pap smear, liquid Pap cytology, automated cervical screening techniques, visual inspection of the cervix after Lugol's Iodine and acetic acid application, speculoscopy, cervicography, and HPV DNA testing. Out of all these, exfoliative cytology has been regarded as the gold standard for cervical screening programs. Pap smear is the simple painless, reproducible, cost-effective, reasonably accurate test, and sensitive tool for screening of various types of lesion in cervix both nonneoplastic and neoplastic. According to various studies, the ECA rate varies between 1.5% and 12.60%., The ECA rate in our study was 2.43%, whereas it was 1.89%, 5.36%, 8.18%, and 2% in Tailor et al., Bamanikar et al., Banik et al., and Malpani et al., respectively.,,, In our study, SCC is the predominant form of ECA followed by LSIL, HSIL, and others. Whereas LSIL was reported as the predominant form in Banik et al. and Malpani et al., The malignancy rate in our study was more than 1%, i.e., 1.31%, whereas most of the studies found the malignancy rate of <1%, i.e., 0.71%, 0.35%, and 0.2% in Bamanikar et al., Banik et al., and Edelman et al., respectively.,, The probable reason for the higher rate of malignancies in our study was due to the late presentation for the symptoms. Furthermore, the age range for ECA in Bamanikar et al. was 20–75 years with the mean age of 44.1 years, whereas, the mean age for ECA in our study was 53.61 years. According to previous studies, the most common age to develop carcinoma of the cervix is the fifth decade, and the precursor lesions occur 5–10 years before the development of invasive carcinoma. However, in this study, HSIL and SCC were seen predominantly (56/75 cases = 74.7%) after 50 years of age group. In the present study, most of the premalignant and malignant lesions occur in patients above the age of 40 years, and Pap smear examination should be started in women at the age of 30–40 years. Hospital-based data are required to detect the efficacy of the Pap smear screening test. The community needs to be enlightened about Pap test through diffuse educational activities. We can develop a cost-effective screening method by training medical and paramedical staff at primary health center level. Denny L. Cervical cancer: Prevention and treatment. Discov Med 2012;14:125-31. Jemal A, Center MM, DeSantis C, Ward EM. Global patterns of cancer incidence and mortality rates and trends. Cancer Epidemiol Biomarkers Prev 2010;19:1893-907. Coste J, Cochand-Priollet B, de Cremoux P, Le Galès C, Cartier I, Molinié V, et al. Cross sectional study of conventional cervical smear, monolayer cytology, and human papillomavirus DNA testing for cervical cancer screening. BMJ 2003;326:733. Kalkar RA, Kulkarini Y. Screening for cervical cancer: An overview. Obstet Gynecol India 2006;56:115-22. Khan MS, Raja FY, Ishfaq G, Tahir F, Subhan F, Kazi BM, et al. Pap smear screening for precancerous conditions of the cervical cancers. Pak J Med Res 2005;44:111-3. Rock CL, Michael CW, Reynolds RK, Ruffin MT. Prevention of cervix cancer. Crit Rev Oncol Hematol 2000;33:169-85. Tailor HJ, Patel RD, Patel PR, Bhagat VM. Study of cervical Pap smears in a tertiary care hospital of South Gujarat, India. Int J Res Med Sci 2016;4:286-8. Bamanikar SA, Baravkar DS, Chandanwale SS, Dapkekar P. Study of cervical Pap smears in a tertiary hospital. Ind Med Gaz 2014;148:250-4. Ranabhat SK, Shrestha R, Tiwari M. Analysis of abnormal epithelial lesions in cervical Pap smears in mid-Western Nepal. J Pathol Nepal 2011;1:30-3. Atilgan R, Celik A, Boztosun A, Ilter E, Yalta T, Ozercan R, et al. Evaluation of cervical cytological abnormalities in Turkish population. Indian J Pathol Microbiol 2012;55:52-5. Al Eyd GJ, Shaik RB. Rate of opportunistic Pap smear screening and patterns of epithelial cell abnormalities in Pap smears in Ajman, United Arab Emirates. Sultan Qaboos Univ Med J 2012;12:473-8. Banik U, Bhattacharjee P, Ahamad SU, Rahman Z. Pattern of epithelial cell abnormality in Pap smear: A clinicopathological and demographic correlation. Cytojournal 2011;8:8. Malpani G, Agrawal P, Varma AV, Khandelwal N, Tignath G. Cervical Pap smear study and detection of abnormal epithelial lesions and determination of its accuracy by cytohistological correlation in patients of tertiary care teaching hospital in central India. Int J Reprod Contracept Obstet Gynecol 2017;5:2312-6. Edelman M, Fox AS, Alderman EM, Neal W, Shapiro A, Silver EJ, et al. Cervical Papanicolaou smear abnormalities in inner city Bronx adolescents: Prevalence, progression, and immune modifiers. Cancer 1999;87:184-9. Bishop A, Wells E, Sherris J, Tsu V, Crook B. Cervical cancer: Evolving prevention strategies for developing countries. Reprod Health Matters 1995;6:60-71.